Super Savings Item! Save 33% on the Pioneer Collage Frame Embossed Travel Sewn Leatherette Cover Photo Album, Brown by Pioneer Photo Albums at Wow In The Details. MPN: 5COL-240TR. Hurry! Limited time offer. Offer valid only while supplies last. This photo album holds 240 4-inch by 6-inch photos in optically clear plastic pockets. 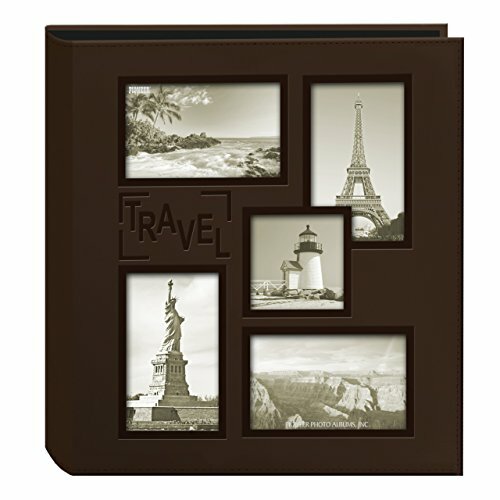 It features a collage frame front with embossed ''Travel'' text. This photo album holds 240 4-inch by 6-inch photos in optically clear plastic pockets. It features a collage frame front with embossed "Travel" text. The album is bookstyle bound in a brown sewn leatherette cover. The unique five pocket page layout design allows for both horizontal and vertical prints to be displayed on the same page.